Zababa-šuma-iddina[nb 1] was the 35th and penultimate king of the Kassite or 3rd dynasty of Babylon, who reigned for just one year,[i 1] ca. 1158 BC (short chronology). He was without apparent ties to the royal family and there is uncertainty concerning the circumstances of his coming to power. A prince will arise and will exercise kingship for 13 years. There will be an attack of Elam on Babylonia and the booty of Babylonia will be carried off. The shrines of the great gods will be ruined and Babylonia will be defeated. There will be chaos, upset, and trouble in the land, and the upper classes will lose power. Some other, unknown person will arise, will seize power as if a king, and will kill off the nobility. There are some concerns over the authenticity of this “letter” as it makes a derogatory reference to a later king, Nabu-apla-iddina, ca. 888 – 855 BC. It may, however, preserve some traditions of the period. 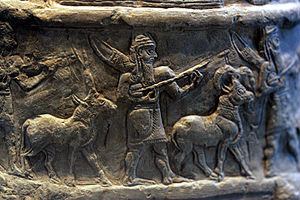 Shutruk-Nahhunte led an assault on northern Babylonia which resulted in the end of Zababa-šuma-iddina’s reign. The event is described in a late Babylonian poetic text[i 5] purporting to be narrated by a later king, possibly Nabû-kudurrī-uṣur I. He left his inscriptions on many of the trophies he collected for display in the temples of Susa, each with its boastful addendum, to confirm it was he who had conquered Babylonia. A fragment of an Elemite stele describes crossing the river Ulai and seizing seven hundred towns. Another fragment lists the northern cities that had been overthrown including Dur-Kurigalzu, Sippar, Opis, perhaps Akkad and Eshnunna. ↑ Kinglist A, column 2, line 14. ↑ Prophecy A, tablet VAT 10179 (KAR 421). ↑ The Synchronistic Chronicle (ABC 21), K 4401a +, tablet B, column 2, lines 10 to 12. ↑ W.G. Lambert (1978). "The Ethel M. Wood Lecture delivered before the University of London on 22 February 1977". The Background of Jewish Apocalyptic. London: The Athlone Press. p. 10. ↑ D. T. Potts (April 2006). "Elamites and Kassites in the Persian Gulf". Journal of Near Eastern Studies. 65 (2): 111–119. doi:10.1086/504986. ↑ Daniel T. Potts (1999). The archaeology of Elam: formation and transformation of an ancient Iranian State. Cambridge University Press. pp. 206–208. ↑ J. A. Brinkman (1976). "Zababa-šuma-iddina". Materials for the Study of Kassite History, Vol. I (MSKH I). Oriental Institute of the University of Chicago. p. 321. ↑ Elizabeth Carter, Matthew W. Stolper (1984). Elam: surveys of political history and archaeology. University of California Press. p. 40.